This Place of Worship was founded in 1861, but we understand it was closed in 2011. "Poor Clare" was a young Italian noblewoman, with a burning desire to follow in the footsteps of St Francis of Assisi. She ran away from home to live under his guidance, at the church of San Damiano, where gradually she was joined by other women, also wanting to be "brides of Jesus". And so their Order was formed. Their abiding rule was they "should be allowed to live simply, without revenues, working for their living and relying on the gifts that people gave them". The Order was given papal approval two days before Clare's death in 1253. The origins of the Poor Clares in England may be traced to 1619, when two English women fled to Belgium to escape religious persecution. They joined the Franciscan Friars in Brussells, and were later joined by others from England, seeking the freedom to follow their beliefs. The community survived in Belgium until the late 18th century, when revolutionary wars on the continent forced them to return to England. They settled first in Winchester, in 1794, and in 1808, moved to Taunton. The Poor Clares Order in Woodchester was founded in 1860, when 16 volunteers from Taunton settled in an old farmhouse there. Their convent building, designed by Charles HANSOM, was built between 1861 and 1869, retaining the mid-17th century house at its core. It is set in 25 acres of ground, and now a Grade II Listed building. The chapel is at the south east end, on the upper floor, above the library and work rooms - see the British Listed Buildings website for more details. There was still a full complement of 30 nuns in 1950, but by 2000 there were just 14. By 2010, when the convent celebrated its 150th year there were even fewer, and in 2011, the convent was closed. It was said that the Order's presence would be sadly missed locally. Though an enclosed order, local people said that Woodchester Poor Clares did not shut themselves away from the outside world. The convent was well known for making altar breads and communion wafers for more that 200 churches and convents. Until 1921 (1927?) it had an orphanage. The graves of 10 orphans and nuns buried at the convent have been exhumed and moved to the nearby church. Woodchester also had a Dominican priory until 1971. The above information was compiled with the assistance of John Williams, and the former website of the Poor Clares of Woodchester (www.poorclare.co.uk). 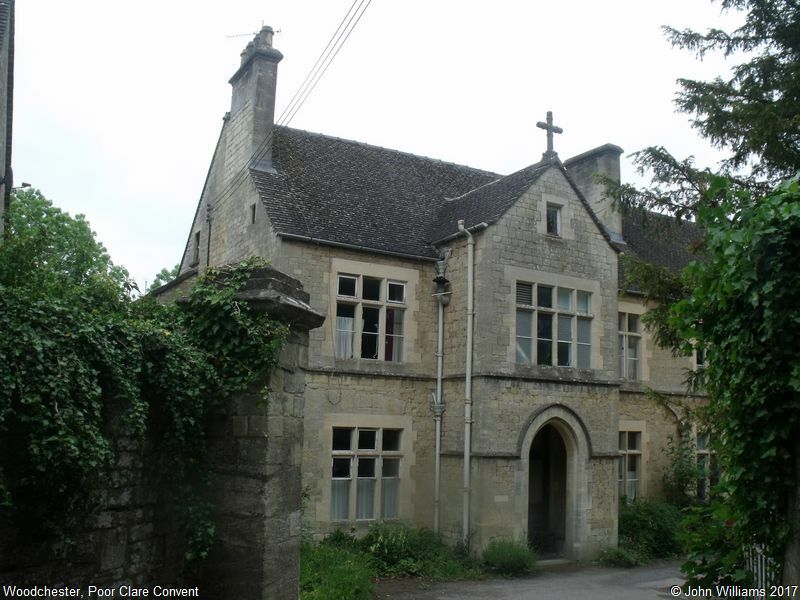 There is a photograph of Convent of Poor Clares, Woodchester on the Geograph website. Now or formerly Roman Catholic (Convent). Poor Clare Convent, Woodchester shown on a Google Map. Places of Worship in Woodchester shown on a Google Map. I have found many websites of use whilst compiling the information for this database. Here are some which deserve mention as being of special interest for Woodchester, and perhaps to Local History and Places of Worship as a whole. You may like to see photograph(s) of Convent of Poor Clares, Woodchester on the Geograph website. Information last updated on 26 Nov 2018 at 16:25. This Report was created 29 Mar 2019 - 00:08:48 GMT from information held in the Gloucestershire section of the Places of Worship Database. This was last updated on 7 Feb 2019 at 07:45.